My morning flower fix. Rhododendron and daffodils, almost done. Lilacs and lily-of-the-valley, just barely starting to open, but still so fragrant. That creamy white/peach daff is also filled with incredibly sweet fragrance. The best of spring! This time of year, our Newport, Vermont Bike Path is a beautiful place to walk! First it was the four baskets. 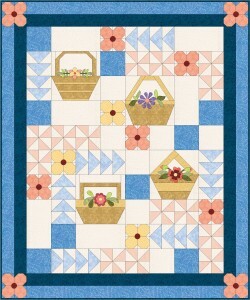 Now it’s time to fill those baskets with flowers, in the Flower Basket Quilt Block of the Month, of course. For Basket 1, we have the Zinnia. Stabilizer like Stitch-n-Tear, typing paper, paper towel, etc. 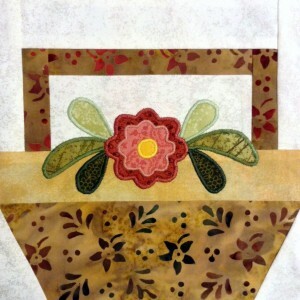 Trace individual appliqué shapes onto paper side of fusible web. If the design is asymmetrical, pieces will have to be reversed before tracing. An easy way to reverse a design is to trace it with a marker that bleeds through to the back side of the paper. Cut out all shapes, leaving a ¼-inch margin around each piece. Place fusible web shapes paper side up on the wrong side of each appropriate fabric and fuse in place following manufacturer’s instructions. Cut out all pieces and peel off paper backing. 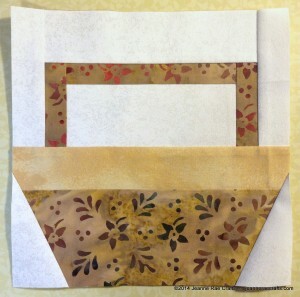 Fold the background square in quarters; crease to aid in appliqué placement. Position pieces, starting with the pieces furthest to the back and working toward those on top. Fuse-baste appliqué pieces in place. An alternative method of placement is to use an applique pressing sheet. Place the pattern sheet underneath the pressing sheet so that the design can be seen through it. Arrange all the overlapping pieces on top and fuse. Let cool and the entire design can be gently peeled off. Using thread to match and a medium satin zigzag setting, stitch around each shape. Either stitch in place for a couple of stitches or backstitch at the beginning of stitching. Threads may be pulled to the back and tied off to secure, if desired. Satin stitches fall just barely off the edge of the appliqué shape into the background. Adjust satin stitches so they “mound” on top by loosening the upper thread tension. This way, no thread from the bobbin will show on top. Ideally, satin stitches should be perpendicular to the edge of the appliqué. Frequent pivoting is required to accomplish this. For pivoting around curves, keep the needle on the outside edge for outer curves (curves away from the center). Keep the needle on the inside for inner curves (curves toward the center). Either stitch in place for a couple of stitches or backstitch at the end of stitching. Remove stabilizer from the back. If you haven’t tried machine applique, give it a try. Practice first on a sample to get your stitching just the way you’d like. Give it a whirl – it really can be fun! Well, out of 6 of us that started, two have finished! I put the binding on mine last night, and it will be hanging in my office tomorrow…I can’t tell you how much I’ve enjoyed doing this – and I get so many compliments on it! I look forward to doing more of your patterns. 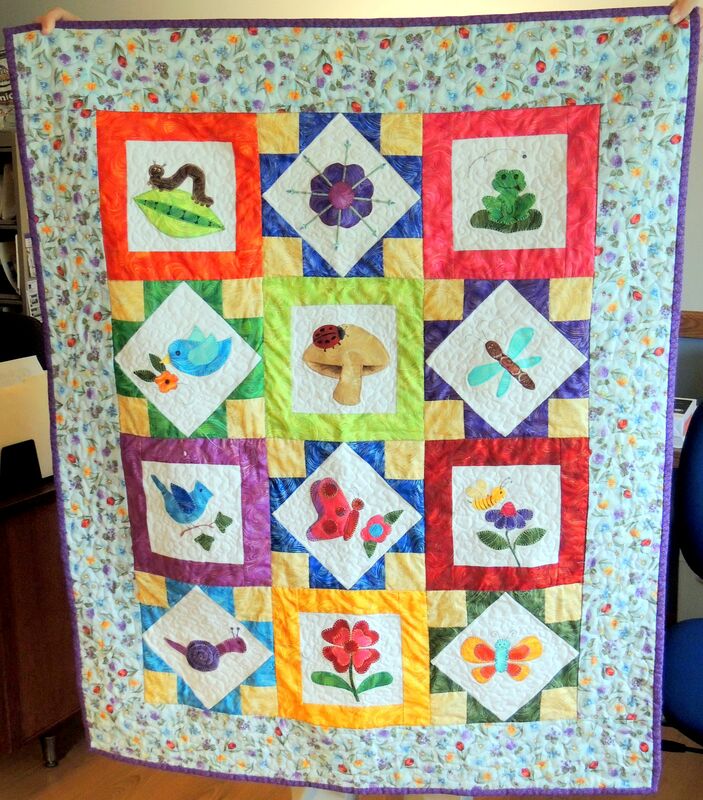 I am pleased to present two of those Pixie Garden Quilts! The first quilt is from Jane. 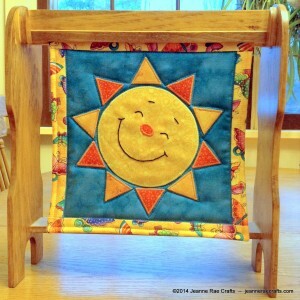 It’s such a bright and cheerful quilt, Jane! Sue from Wisconsin has done a wonderful job with her Pixie Garden also. Each block has a different bright color scheme with the border fabric tying it all together. Wonderful! Close ups show the detail in applique, embroidery and beading that Sue did – wow! What beautiful quilts! Thank you so much for sharing your handiwork, Sue and Jane! This time of year, onions in storage want to sprout. 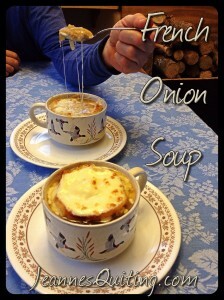 What better way to use them up than in a savory, but almost sweet, French Onion Soup? Heat butter and olive oil in a soup pot to melt. Add onions and cook over medium heat, stirring frequently to avoid scorching. Reduce heat after the onions begin to turn color and continue to cook, stirring, until a rich brown, about 40-50 min. Stir in the wine; increase heat and cook for 1-2 min. Add broth, salt and pepper. Simmer for 20 min. Ladle soup into ovenproof bowls placed on a cookie sheet. Toast bread under broiler; top soup with toasted French bread. Sprinkle with cheese, about 3 tablespoons per serving. Broil until cheese is bubbly and brown. Makes about 4 servings. Hello, all of you quilters! There’s a new block in the Flower Basket Block of the Month! I’ve named it so creatively – Basket 2. 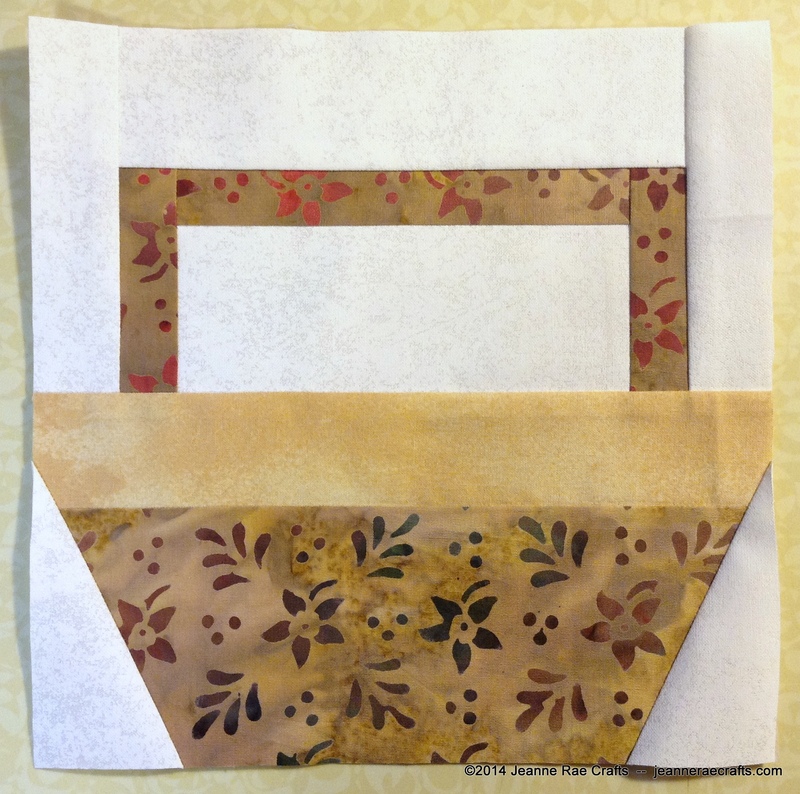 Tip: When done stitching each basket block, leave the paper foundation on the back. It will stabilize the block until it is sewn together with other blocks. It will also automatically act as the stabilizer when doing the machine appliqued flowers in future months. Today I received an email from Beryl in Australia inquiring about a little quilt on one of my Gallery pages, Spring Flowers. I must have made that wall hanging 18-20 years ago! The photo is tiny and low resolution because back in 1998, computers had about as much power as a calculator does now. Anyway, I thought it was a good time to bring back an up-dated version of that design as a new freebie! 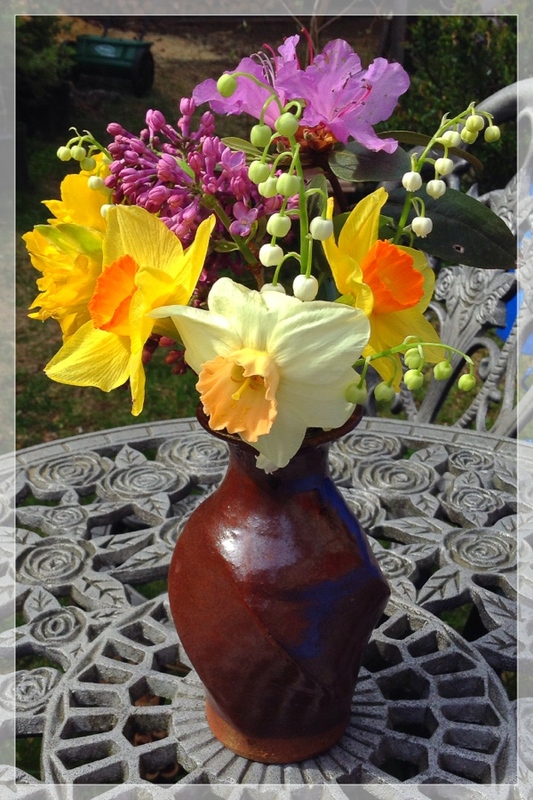 Besides, it was 20 degrees below 0 this morning, making spring flowers sound so good! I hope you enjoy this paper-pieced project, Spring Flowers Wall Hanging. 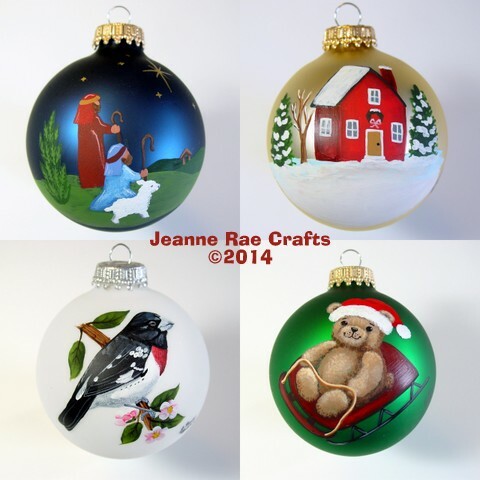 Announcing…drum roll, please…my new ornaments for 2014! The whole design process is pretty haphazard. I always add a bird so the Rose-Breasted Grosbeak is our 20th bird. Bill and I are birders, totally love bird watching and painting birds comes easily to me. 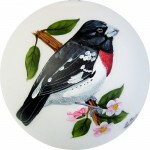 Rose-breasted Grosbeak ornament from Jeanne Rae Crafts. The Teddy Bear Sled was Bill’s idea. So I came up with this little fellow. What I didn’t realize is that Bill really wanted the bear to be sitting. So reject that poor bear and start anew. I was not thrilled at the time, but I’m pretty happy with the end result. 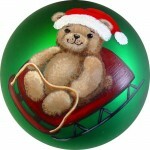 Teddy Bear Sled ornament from Jeanne Rae Crafts. The Shepherds ornament is the result of years of hoping to come up with something and finally just doing it. We’ve needed a companion ornament to go with the Nativity and Three Wise Men, and this works just fine. And finally, the New House ornament is for just that. Customers often ask what I would recommend for “First Year in Our New Home”, that sort of gift. So now we have this New House. It would work well also for “From our house to yours” or “Hearts come home at Christmas” or “I’ll be home for Christmas”. If you need a house ornament, now we’ve got it covered! New House ornament from Jeanne Rae Crafts. Yay! New ornaments are done and designed for this year! That is a big deal for me. If you have an idea for an ornament you’d like to see, let me know. It just might happen! Now onto painting on wood. Keep warm and stay tuned. 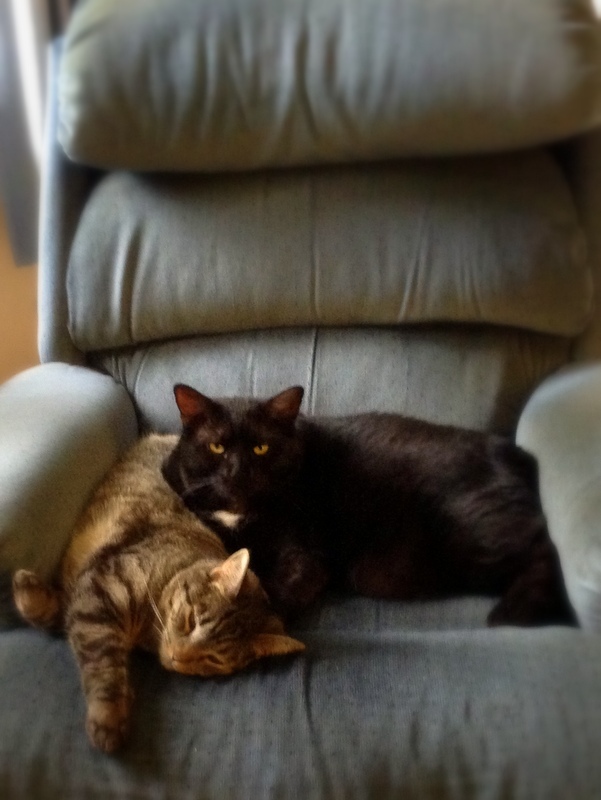 We love our cats, Betsy and Smoky, but they can be rather destructive at times. Take our wicker clothes hamper. 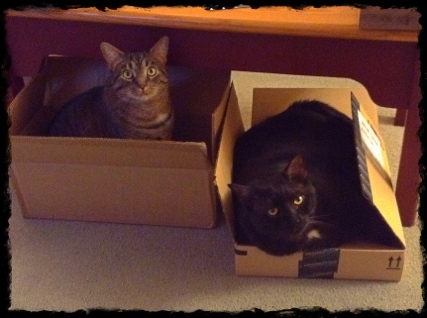 They shredded it to the point that they could climb right in, settle in for a nap even. We finally threw it out several months ago, using a laudry basket instead. I suggested to Bill that we could really use a hamper where, every morning, he could sit to tie his shoes (he’s so not bendy). Best of all, it’s cat-proof! Oh, my, it has been a long time. Apparently, I don’t juggle all aspects of my life very well… Enough said! Ta-daaaah! 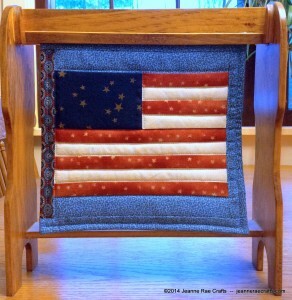 Presenting the 2014 Block of the Month from Jeanne’s Quilting! 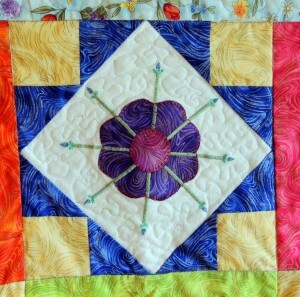 The Flower Basket Quilt features four foundation paper pieced baskets with appliqued flowers. 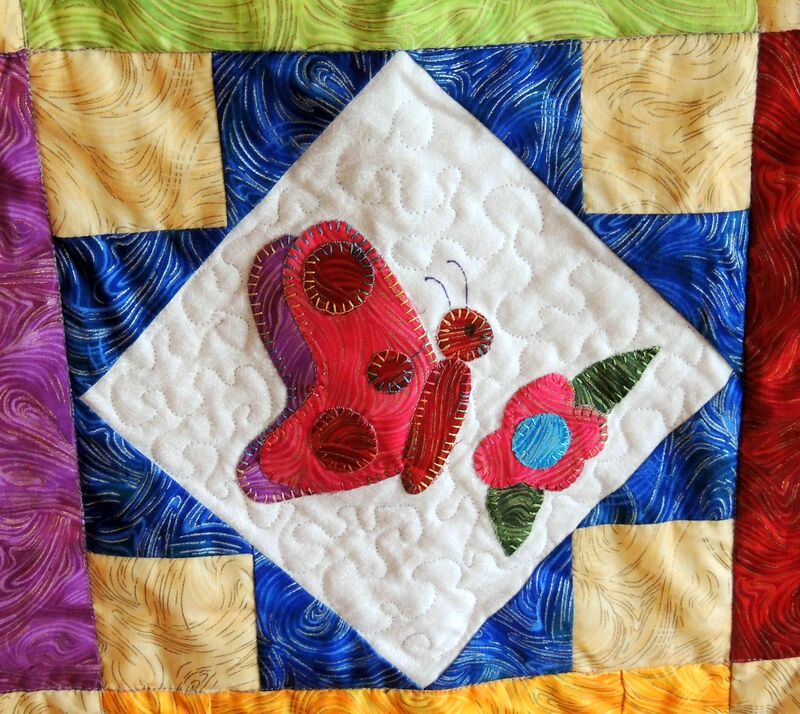 The appliqué in this quilt was designed with machine appliqué in mind but is still suitable for hand appliqué. 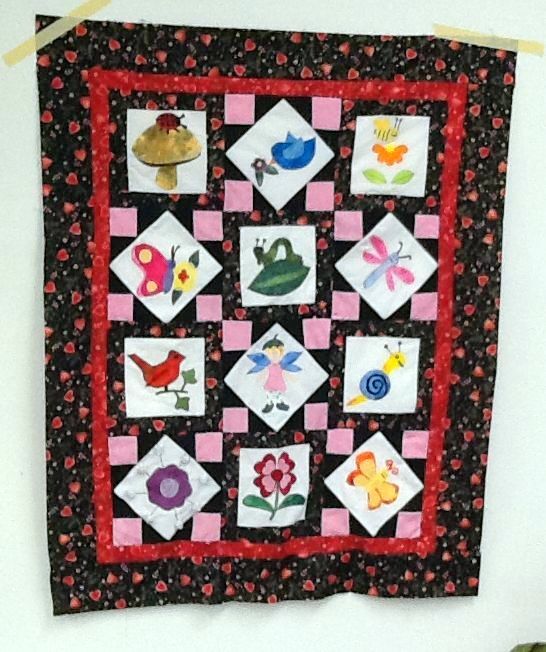 Other elements include pinwheels, flying geese and pieced posies. The twelve steps to making the blocks will be introduced throughout the year with the finishing directions to end the year’s lessons. 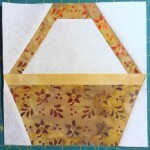 The first block is Basket 1, a foundation paper pieced block. If you’re new to foundation paper piecing, fpp for short, there is a wealth of information both online and in books. Connecting Threads has a good video fpp tutorial here. I never really liked to paper piece until I took a class from the queen of paper piecing, Carol Doak. She has a good page of instructions here. One thing that I find indispensable when paper piecing is the Add-A-Quarter Ruler. I have the 6″ but for this project, the 12″ would really come in handy. Do you have a favorite paper to use as a foundation? You can use typing paper, vellum, specialty paper or a water-soluble paper. My favorite is Carol Doak’s Foundation Paper. Here’s a sneak peak at some of the little blocks you’ll be doing in future months. Look easy, don’t they? So choose your fabrics and start cutting. Your first basket will be done in no time! Next month: Basket 2. Happy Quilting! At my quilt guild, the North Country Quilters, Christmas party, we hold a gift exchange. I received a most unique gift from my quilting friend Valerie – a cookie quilt! Valerie said she has made gingerbread since she was a kid, even taught gingerbread house classes. 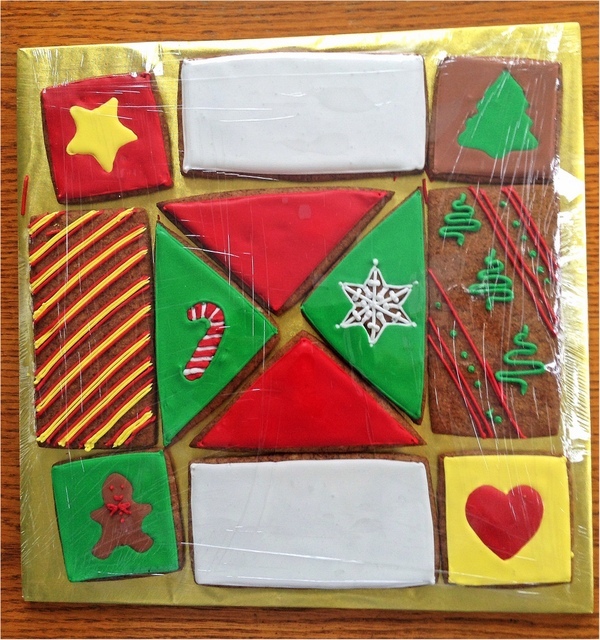 You can tell – not only are the decorations exquisite but the cookies taste fabulous! Thanks so much, Valerie! 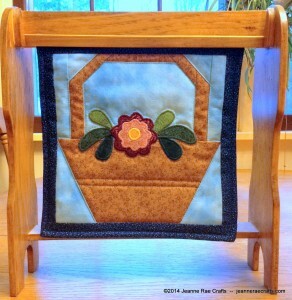 Last year I gave my daughter-in-law Deb a little quilt rack that my husband Bill had made. By little, I mean tiny. She brought it to work to add a homey touch. Her idea was to have a little quilt for each month. I’ve already done Jan.-Apr. but never took pictures. 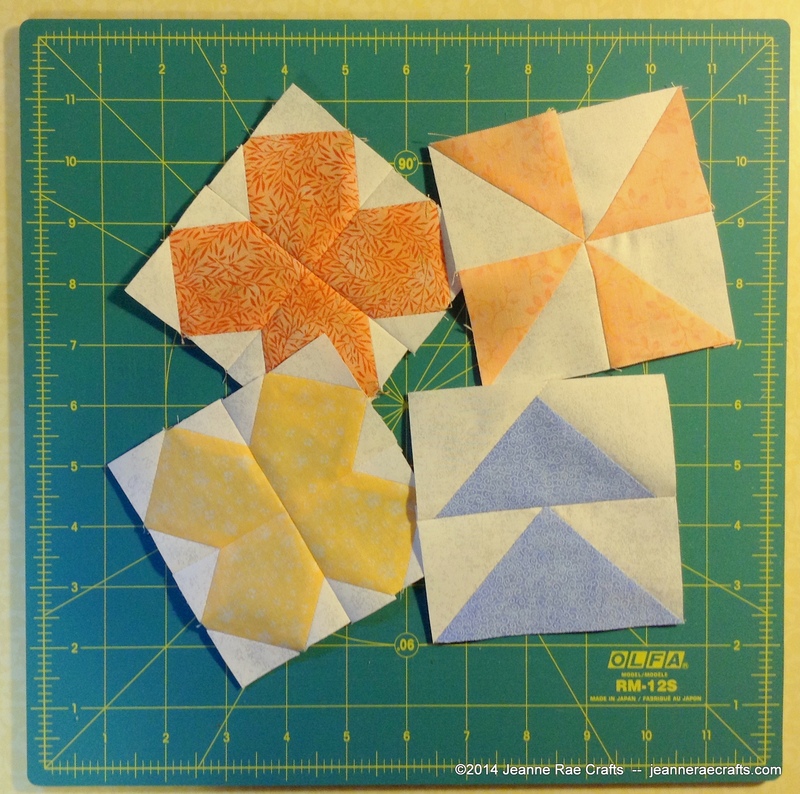 Here’s the next three little 9″ quilts. Really, they could be pot holders but they are so pretty as little quilts! 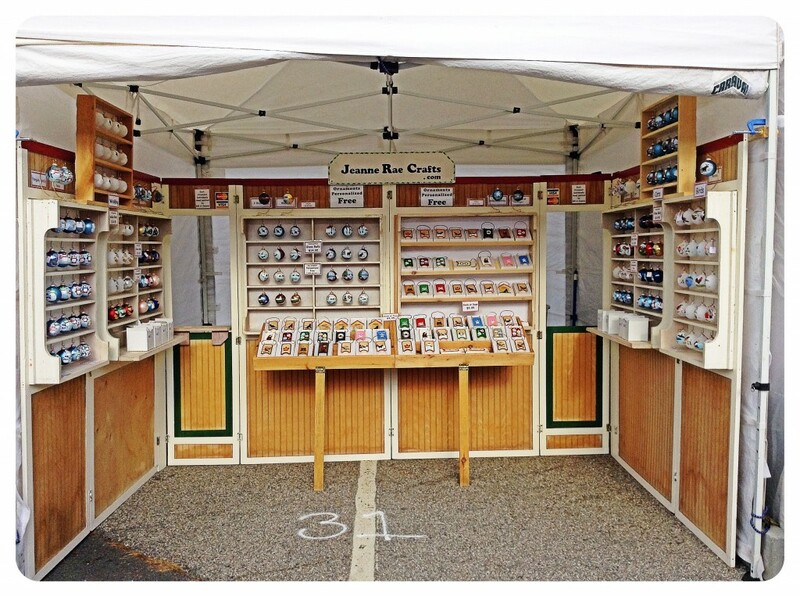 Our last outdoor craft fair of the year! 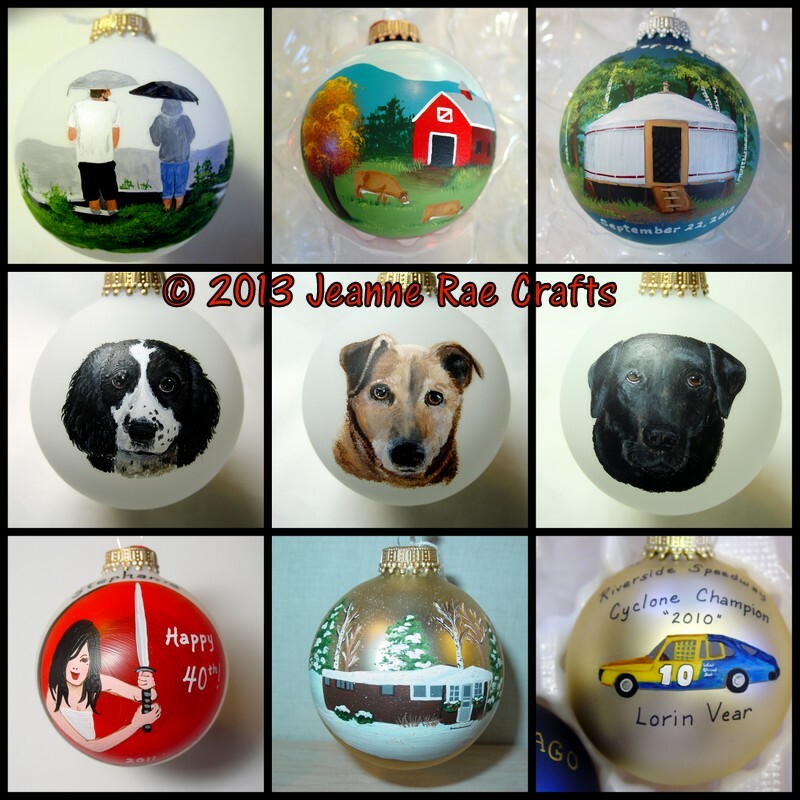 One of the most fun aspects of my business is doing custom ornaments. 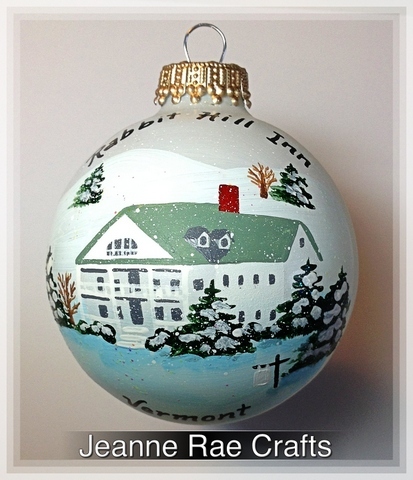 Rabbit Hill Inn, an award-winning inn here in Vermont, has sold my custom ornament for many years now. 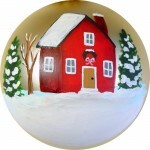 I’m constantly amazed at what designs customers want on a custom ornament. Pets, of course, are always a favorite, closely followed by vehicles of all kinds. But there’s also special events, houses, cottages, and the most unusual to date, a yurt! If you were to wish for a custom ornament, what would yours be? Here’s a custom order form – you can make it happen by ordering one now! Let the Ornament Season Begin! Fall – it’s a change of seasons for us in more ways than one. 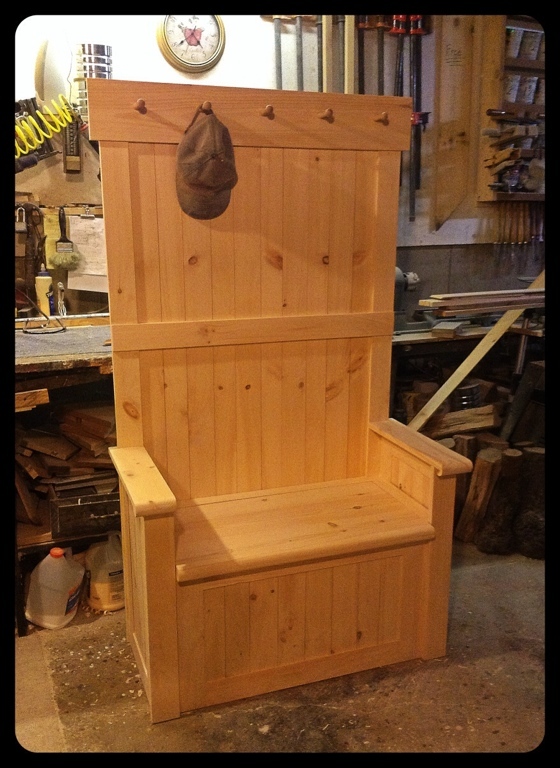 From April until early September, we sell our hand crafted furniture at all of our craft fairs. This past weekend was the big switch to selling ornaments at craft fairs. 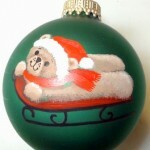 Our ornaments are hand painted glass balls, dough ornaments and little sleds. Have you seen our sleds? Bill has built them from Vermont basswood and we both paint them with our original designs. Here’s a little introduction. You can see us next Lincoln, NH on Labor Day weekend. October 12 – 9 a.m. – 5 p.m.
October 13 – 9 a.m. – 5 p.m.
October 14 – 9 a.m. – 4 p.m. 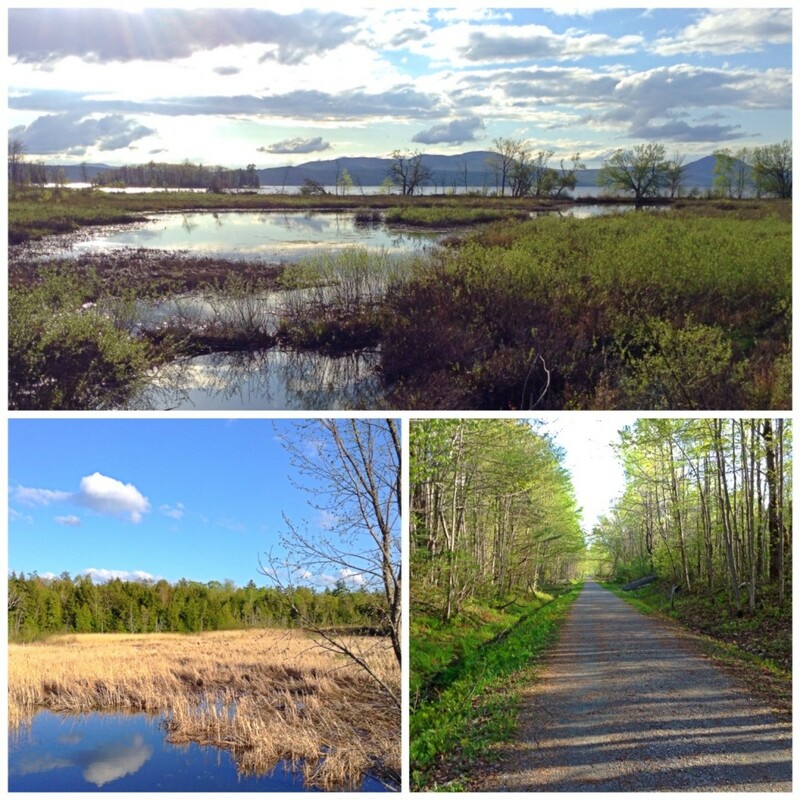 I live in Vermont's Northeast Kingdom with my husband Bill and two cats, Smoky and Betsy. 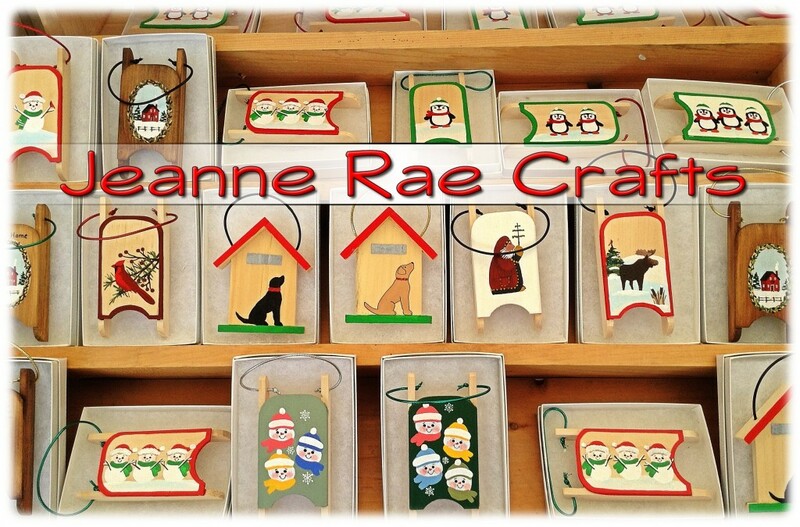 I love to quilt (see About my quilting in "Pages") but owning a small business, Jeanne Rae Crafts, means I spend much more time painting. This blog will let you in on how I try to juggle it all.